Now dean of students at Goshen College, Perez is EMU’s 2018 Distinguished Service Award recipient. He graduated with a bachelor’s degree in social work in 1994 and a graduate certificate in conflict transformation from the Center for Justice and Peacebuilding in 1999. Perez did not realize he would follow in their footsteps. Instead, he contemplated being a high school band teacher like his role model, Charles Cabrera. After experiences at Hesston and Bethel colleges, Perez did two years of Mennonite Voluntary Service in San Antonio at a community health clinic, followed by a Mennonite Central Committee summer service term in Newton, where he carried out a community needs assessment. Read about New York City-based alumni in the current issue of Crossroads magazine. In 1994, in protest of a Harrisonburg police shooting that killed an immigrant, Perez wrote a letter to the newspaper, even knowing he had a practicum in Harrisonburg’s juvenile probation center the following semester, where he’d work alongside police and prosecutors. “I knew I had to speak the voice of this individual without a voice,” Perez said, adding that he was supported in the act by his practicum supervisor Ben Risser. Another “formative experience” was participating in civil disobedience a few years later as a young father on the Puerto Rican island of Vieques, calling for closure of a U.S. Navy and Marine bombing target range. He was then in a five-year stint as a hospice social worker and mental health counselor at Hospital General Menonita, as well as a peace evangelist for the Mennonite Church USA. (In 1994, Perez married Denise Diener ’92, who was raised in Puerto Rico; the couple has three children, the oldest is completing her first year at Goshen.) During this period, Perez also earned a master of social work at the Interamerican University of Puerto Rico-Metropolitan Campus. The couple then moved to Goshen. Perez offered therapy to individuals, mostly first-generation Mexican newcomers, suffering persistent and serious mental illness at the Latino Behavioral Health Division at Northeastern Center, located in Ligonier, Ind. He questioned how to find and sow joy among individuals in great distress, having trouble adjusting to a new culture, feeling unwelcome. The answer was to help plant newcomers in supportive networks where they use their own unique gifts to become involved in their new communities. In 2004, he wrote a mental health promotion curriculum and trained leaders to use it in schools, churches, juvenile correction facilities and other Indiana venues. Bienvenido is now used in 13 states and a Canadian province, and was selected as one of 16 nationally recognized mental health programs by the Substance Abuse and Mental Health Services Administration and the National Latino Behavioral Health Association for its community-defined evidence with Latino immigrants. More recently, he founded Bienvenido Community Solutions, with a focus on building bridges connecting community organizations, mental health research teams and health organizations. Partnerships with the Columbia University School of Social Work and the Indiana University School of Medicine have helped research teams better understand the mental health of Latino youth. For his success in building Bienvenido into a major force of advocacy for the well-being of Latinos in Indiana, the Governor’s Commission on Hispanic/Latino Affairs named Perez Indiana’s Hispanic of the Year in 2007. In 2017, the Indiana Undocumented Youth Alliance awarded Perez the Chickadee Bird Award for his steadfast support for immigrants and immigrant youth throughout Indiana. 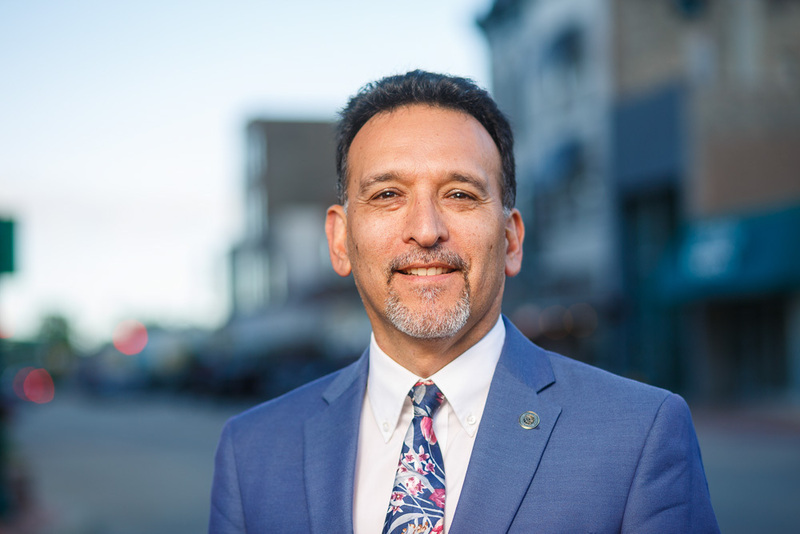 In 2018, Elkhart Community Schools selected Perez as one of seven Local Defender of Human Rights award recipients. Authenticity is one of three principles Perez adheres to in his commitment to following Jesus. The other two: allowing the Spirit to guide him and simply being patient and present with people as they work their way into a better place. Perez joined the Goshen College faculty as associate professor of social work in 2012. He then served for three years as senior director for the Intercultural Development and Educational Partnerships at the Center for Intercultural and International Education. Educational partnerships established with groups such as the Mexican Consulate in Chicago, ReconciliAsian, My Hood Needz Me, and Latino and African American congregations contributed to growth in Goshen’s racial and ethnic diversity. Perez also founded and developed an educational program for Latino entrepreneurs that is funded and promoted by Mexican consulates in Chicago, Detroit and Indianapolis, and beyond. In 2017, Perez experienced two major life transitions. He began doctoral studies in educational leadership with a focus on transformational leadership and he became dean, a position which shares commonality with his previous endeavors: “thinking with and hoping with students and student life staff on ways to create an environment centered on trust, transparency, and supportive relationships.” The position creates opportunities to put into practice his social work skills learned from mentors and other leaders throughout his professional career. A version of this article was first published in the Spring/Summer 2018 Crossroads. Read more articles here. Congratulations to my friend Gilberto Perez for all his accomplishments. I remember interacting with his family in Texas when in the years 1983-88 I served as pastor of the Alice Mennonite Church and also as overseer of STMCC (South Texas Mennonite Church Council). So, it was a great joy to me that he will be honored with the EMU’s Distinguished Service Award. Keep up the good work, Gilberto.